When we first saw the interior of our home we fell in love with it. The original plaster walls, nearly unblemished wood work and wood floors in practically every room sold us on this little 1925 bungalow. Once we moved in, we weren’t quick to rush into furnishing it or painting it. We took our time living in the space and finding what felt right to us. And over the past four years we’ve done work in each room, refinishing cabinets, painting walls, putting in the electric work for surround sound, reconfiguring all of the landscaping, adding a privacy fence and getting a new roof. It didn’t need any changes to be liveable, it just needed changes to suit us. Not a fan of large projects that disrupt our life, we’ve put off some of the other cosmetic issues and have been pretty good about ignoring things that we should really be doing. Refinishing the bathroom floor and putting in a new toilet and sink would be lovely. Reglazing the bathtub would be even better. Changing the lighting fixtures in each room and painting the ceilings are on the list too. But none of these projects is quite so urgent as our kitchen floor. With dingy white woodwork that refuses to get clean and with white duct tape holding down the seams in the tattered linoleum, the kitchen can sometimes make my skin crawl even though it’s often my favorite place to unwind. Most of the time I just try not to look down. I mean, seriously. I live with this. 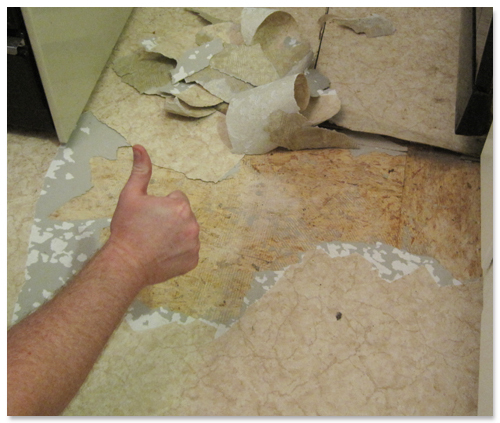 So, last week Regan and I started ripping up the linoleum, figuring out what to do as we went. There’s nothing like kicking it into high gear when you realize there’s no turning back. As we stripped down the linoleum to find the plywood beneath, we decided to be super cheap and creative by simply refinishing that. And so this week has been a blur of long days at work followed by evenings of fast food dinners and kitchen floor painting. Tonight I’m letting the 6th coat dry while I finalize my plans for stenciling on top. This weekend we’ll put layer after layer of polyurethane over it all and hope that’s enough to finish it for the wear and tear of the next several years. I’m feeling good about things though. Here’s hoping by next week I’m back in the kitchen, walking about and making fresh meals for us again while I stare at a lovely new floor. Whatever happens though, I know this guy is going to be really happy to have free reign of his home again. I love the picture of Jack. He is so cute! Looks very much like Georgie when I blockade her outside the kitchen as I’m mopping. 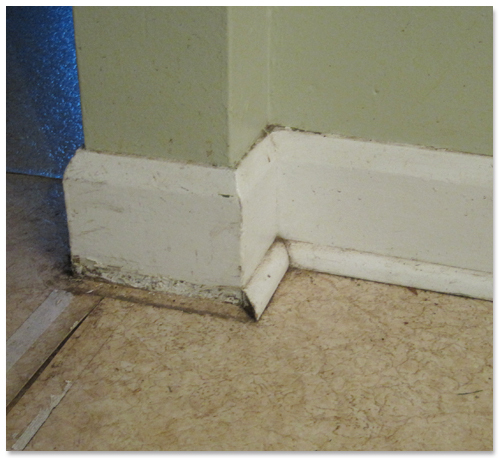 Speaking of kitchen floors… I dont’ want to one-up you but ours was awful up until about a year ago. It was really old granny linoleum that NEVER looked clean, even when I scrubbed it up. Now it’s a new, clean lino, but it’s still cheap and curls up around the edges. I think in my next house I’ll stop fighting it and just go back to dirt floors. Before we put bamboo in ours, we had plastic vinyl squares that I believe were meant to look like fake rock. So it was almost on purpose supposed to look dirty. It was SO so awful. Maybe that’s what linoleum is trying to mimic? Dirt floors. That seems reasonable, actually, considering how horrible everything always looks and how they seemed to be designed to resemble filth. 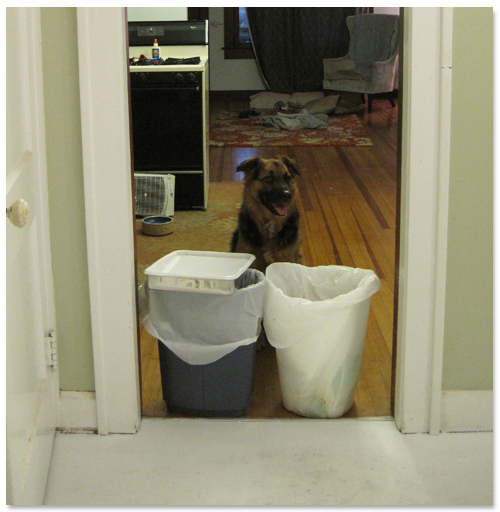 Garbage cans can really keep dogs out of places? Why did we buy baby fences?! I never ate so badly as I did when we were refinishing our kitchen. I swear I never ate so much fried food in my life, mostly Wendy’s (cause it was closest). It was so awful. Dude. Our hood needs some better options, doesn’t it? Eating out is exhausting.